There are still nearly five weeks left until baseball’s trade deadline. But the addition of a second wild-card spot per league has roped more teams into contention, and more teams into believing they are contenders. That leaves a dearth of sellers dangling limited talent. Which in turn makes aggressively pursuing trades, even this early, a wise move for many ball clubs. Here are five of the teams with the most glaring needs and the most incentive to make moves, given their place in the standings and likely future outcomes. Only designated hitter is considered an easier position to play than first base (per Bill James’s Defensive Spectrum), meaning first shouldn’t be a place where offense is woefully lacking. Yet James Loney has played in all 67 Dodgers games this season, and has exactly two homers to show for it — tied with Logan Morrison for the worst power output at first in the league. It’s not as if the Dodgers haven’t known for years, too: Loney racked up a career-high 2.3 Wins Above Replacement last year, a tick above league-average production. But he still hit only 12 homers in 2011, and his solid defense isn’t enough to offset his perennially lousy hitting. The problem is compounded by the Dodgers’ third-base woes: Juan Uribe is hitting .238/.287/.327 in year two of a three-year, $21 million contract, and Juan Rivera and Adam Kennedy offer the better part of two decades as proof that they’re not the answers either. Here’s one of several teams who could and maybe should inquire about Boston’s Kevin Youkilis, given that the Dodgers’ two worst holes are also Youkilis’s preferred positions. Of course Youk hasn’t been an effective hitter for a good year now, either, and there’s no guarantee his .216/.299/.345 year-to-date line would improve dramatically simply by switching leagues, given the nasty state of his back. 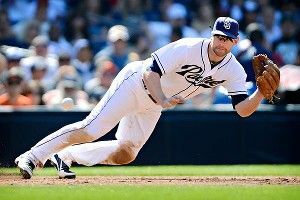 One thought: San Diego’s Chase Headley, hitting a career-best .271/.378/.425 while playing his usual excellent defense at third. Headley isn’t free-agent eligible for two-plus more years, and teams can be reluctant to trade key players within their own division. But the Padres could augment their already promising stable of young players and prospects in a big way with a well-executed trade, even though Headley himself is just 28. With Homer Bailey and Mike Leake pitching better lately, the #FreeAroldis cries have calmed down some, leaving the Reds’ leaky outfield as the club’s main concern. Center fielder Drew Stubbs sits on the disabled list with an oblique strain, but he’s been on a downward spiral for the past two seasons anyway, dropping his Weighted On Base Average from .345 in 2010 to .314 last year and .306 in 2012. Still, Stubbs is making just over league minimum and has shown flashes of excellence in the past, so the Reds would seem likely to stick with him. They owe no such favors to the left-field combination of Ryan Ludwick and Chris Heisey. Ludwick once hit 37 homers in a season for the Cardinals — but that was four years ago. He was a roughly league-average player in 2009 and 2010, a near-replacement-level player last year, and a high-power (.232 Isolated Slugging) on-base sieve (.301 OBP) this year who turns 34 in July. Heisey’s numbers last year suggested a similar skill set: 18 homers in 276 at-bats, but also a poor .309 OBP. Minnesota’s Denard Span could play either left or center depending on how things shake out, providing good defense and a nice boost in on-base ability (career .360 OBP) for a team that ranks just middle of the pack in OBP despite Joey Votto doing a nightly Ted Williams impression. Span is bringing home a very affordable $3 million this season and is owed $11.25 million for 2013 and 2014 combined and a $9 million club option in 2015. The Twins would need a 200-foot ladder just to see third place, so they’d almost certainly be motivated sellers. Ten weeks ago, the world expected the Tigers offense to annihilate the American League, even challenge the 1,000 runs mark. But injuries as well as abysmal performances by several starters have relegated the Tigers to just seventh in AL runs scored. Tigers owner Mike Ilitch and GM Dave Dombrowski have shown seemingly unlimited aggressiveness to date in player acquisition, with big moves ranging from last year’s inordinately successful Doug Fister pickup at the trading deadline to the Prince Fielder signing that launched a million money/pizza/Prince Fielder jokes. The tricky part is figuring out which area(s) to upgrade on a suddenly Swiss cheese roster. Starting DH Delmon Young, right fielder Brennan Boesch, and both sides of the second base platoon (Ramon Santiago and Ryan Raburn) have all dwelled below replacement level this year. The Tigers might have trouble getting over Delmon Young’s laser show from last year’s playoffs, and they might take a wait-and-see approach with Boesch, too, after his solid .346 wOBA in 2012. But the second-base market figures to be painfully thin, leaving the other two spots as easier-to-fill targets for Detroit. Padres LF Carlos Quentin’s name has been linked to the Tigers in rumors. Even after an 0-for-4 Tuesday night, Quentin’s hitting an insane .373/.493/.780. That’ll come down as Quentin’s season goes beyond 73 plate appearances. How much longer the notoriously fragile Quentin can stay healthy will help settle the debate over whether or not the Tigers should make a run at him. The Rays knew what they were getting when they signed Jose Molina: an offensive zero who’d likely play 90-100 games max, but also a player with such impressive pitch-framing skills that he could sway a game or two (or three) that way, and even help make a previously lousy closer into a legend, on the right day. But 67 games into the season, the reality of Tampa Bay’s catching situation is starting to sink in: Molina’s hitting just .196/.271/.327, and backups Jose Lobaton and Chris Gimenez don’t bring a ton as backup catchers, especially not backup catchers who are called upon to play nearly half the team’s games behind the plate. No chance getting any of the elite hitters — Mike Napoli, Joe Mauer, Carlos Santana, Brian McCann, A.J. Ellis (!!) — at the position. Might the Padres part with Nick Hundley, given he’s hitting .169 and San Diego has top catching prospect Yasmani Grandal standing by to claim the big league job? Hundley had a huge season in 2011, hitting .288/.347/.477 in 308 plate appearances, paving the way for a three-year, $9 million contract (plus $5 million option) that could give the Rays a solid, medium-term answer to their organization-wide catching vacuum. Oakland’s Kurt Suzuki could also be an option given the A’s current also-ran status, but Suzuki’s own awful season (.218/.259/.272) is even more perplexing, given this is a player with a pair of near-3½-win seasons on his ledger. A healthy Ramon Hernandez out of Colorado could be intriguing, too. We’ve beaten the Cardinals’ run differential to death this year, but it’s safe to say that a team with an expected win-loss record five games better than its actual record shouldn’t pack it in just because they’re a few games behind the division and wild-card races. Lance Lynn has been a godsend, but injuries to Chris Carpenter and Jaime Garcia have left St. Louis short-staffed. This could work out to the Cardinals’ advantage, though, depending on how aggressive they want to be and what some other teams do. Zack Greinke, Ryan Dempster, and Brandon McCarthy are all free agents at year’s end, and the Brewers, Cubs, and A’s fit the profile of likely sellers given the way they’ve played (in the Cubs’ case, they’re a lock to start selling sometime soon). The big wrinkle would come with the Phillies packing it in at some point: If they become sellers, free-agent-to-be Cole Hamels likely comes into play. Few teams figure to have the combination of glaring need, tradable talent, and the will to pull off a true blockbuster on a walk-year player. The Cards could be at or near the top of that list.